Part two of two of my long bank holiday weekend bike ride to the most northerly tip of Britain. I had a very comfortable sleep in Windhouse Lodge, the gatehouse to Shetland’s most haunted house, built in 1707. There were no signs of any ghosts, unfortunately! If you haven’t read Part 1 of this series already you can find it here: Highway to Yell. Through the night the sea mist had rolled in fairly thick. So thick that you couldn’t see more than a few metres ahead of you and it was terribly cold despite there not being much of a wind. 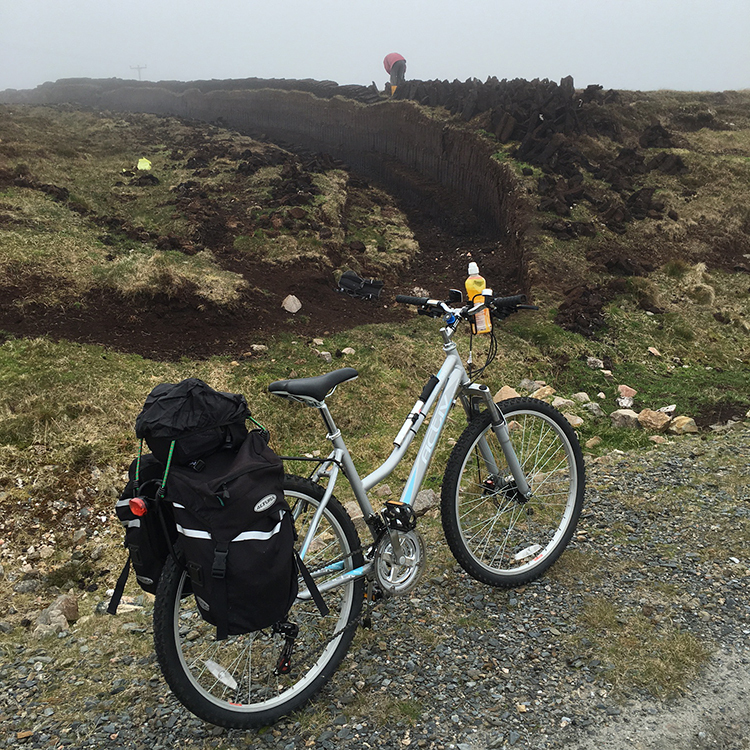 I headed north to catch the morning ferry to the island of Unst – Britain’s most northerly inhabited island – and I couldn’t see a thing. I might have silently grumbled to myself that this sort of thing is why my family might choose to stay home in the warmth of our house instead of coming adventuring with me. It was cold and the sea mist was damp. I was questioning whether or not my cycle trip was a good idea after all. As I came around a corner I spotted a car parked by the side of the road. This time of year, in Shetland, that means one thing: someone’s cutting and raising peats nearby. Raising peats is something I’ve been wanting to have a go at for years. Thousands of years of compressed peat are cut and lifted with a tushkar, a special tool, and set out to dry in the sun. 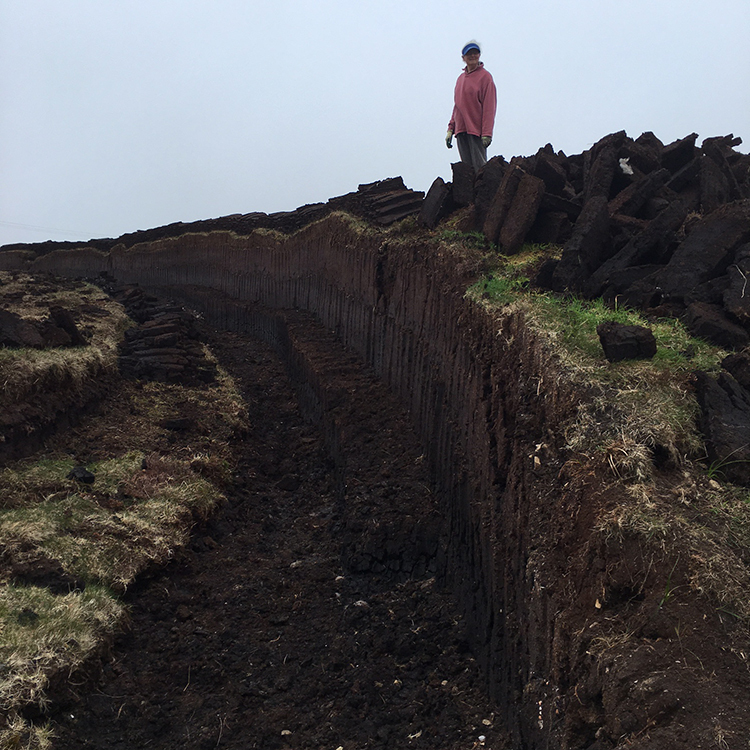 After a few days the peats are stacked into small pyramids of about 6 or 8 to allow the air at all the surfaces to dry them further. At the end of the summer the dried peats are all brought home and these are used as a source of fuel for the winter months. As I had no timetable and could always catch the next ferry, I stopped and asked if I could help. Raising peats is on my list of 40 Things to Do Before I Turn 40, and this was as good a time as any to try. There was a husband and wife couple tending to their perfectly cut peat bank that morning. 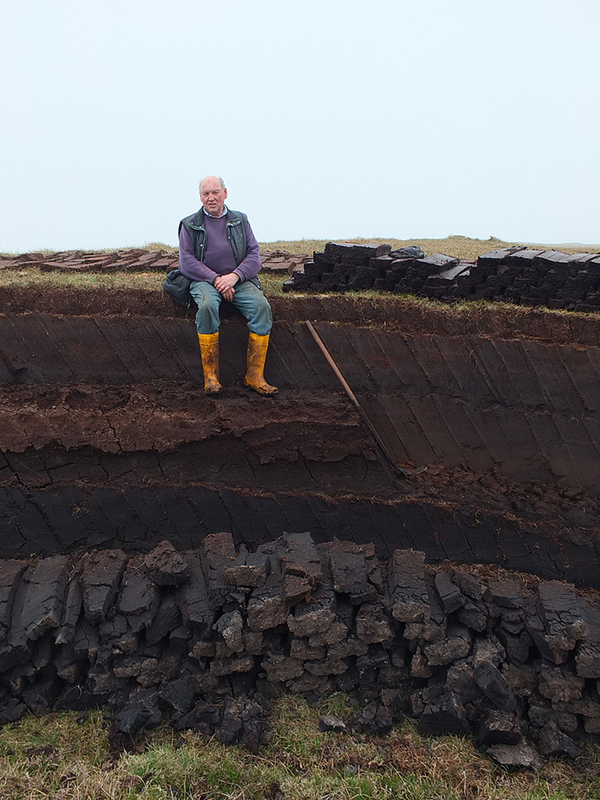 They’ve been raising the peats in this bank for the last 23 years – approximately 15,000 each season. This provides enough fuel for 15 months, he told me. Everything in their house is run off peat, she explained, they heat their house with it and cook their food over it. I helped out for about a half an hour, stacking peats into pyramids, rather pleased at my quick progress (I don’t think she fixed them after I left?) and then I had a go at cutting and raising. I don’t have the upper body strength to do that, but I did try! It’s like trying to cut out a big slab of mud from the earth in one neat motion and then lift it up onto the top of the bank to dry. Big respect to those who cut their own peats year after year. I agree with what the wife said: if folk had to cut their own energy out of the earth they might be a little more frugal about how they use it, putting a jumper on instead of just turning the heating up. As luck should have it, although I thought I would miss my ferry it turns out that I would have arrived half an hour early if I hadn’t have stopped. I caught the ferry to Unst in the thick mist, wiping the cold, damp wet from my glasses and putting my gloves on. 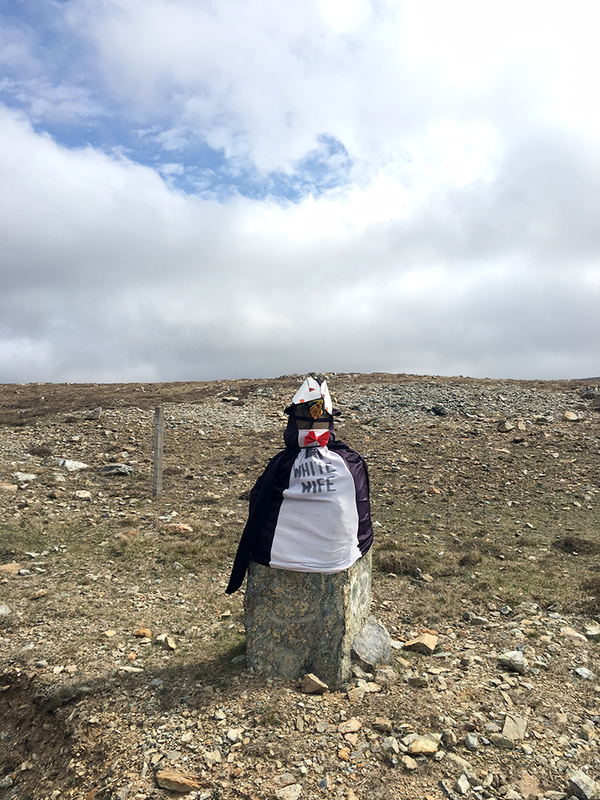 By the time I arrived a few miles up the long lonely stretch of road to The White Wife, a stone set up to mark the place where a ghostly white woman is supposed to appear to lone male travellers at night (it was dressed up as a puffin though?! ), the weather had thankfully begun to clear. I grabbed a nearby geocache (thank you UnstFest!) and headed further north. There was barely any traffic on Unst, and the gentle, almost flat, roads were a pleasure to cycle on, especially with the temperature warming up and bits of blue sky starting to appear. I found myself smiling at nothing in particular. The Final Checkout Cafe in Baltasound opens at 11 on a Sunday, and they boast a small selection of filled rolls, sandwiches, toasties, soup, tea and coffee and a selection of home bakes. 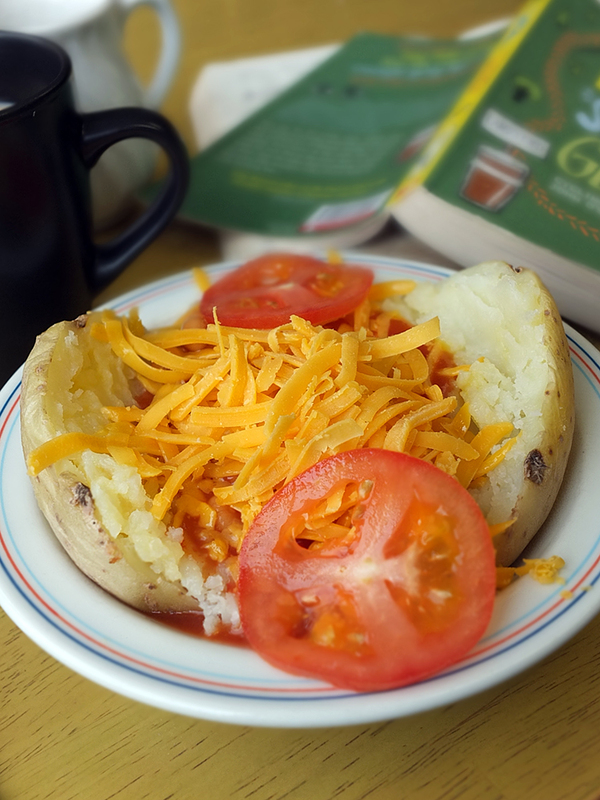 I opted for a baked potato (microwaved – what is it with the northern isles and microwaved food – see my meal at The HillTop Pub in Part 1?!) 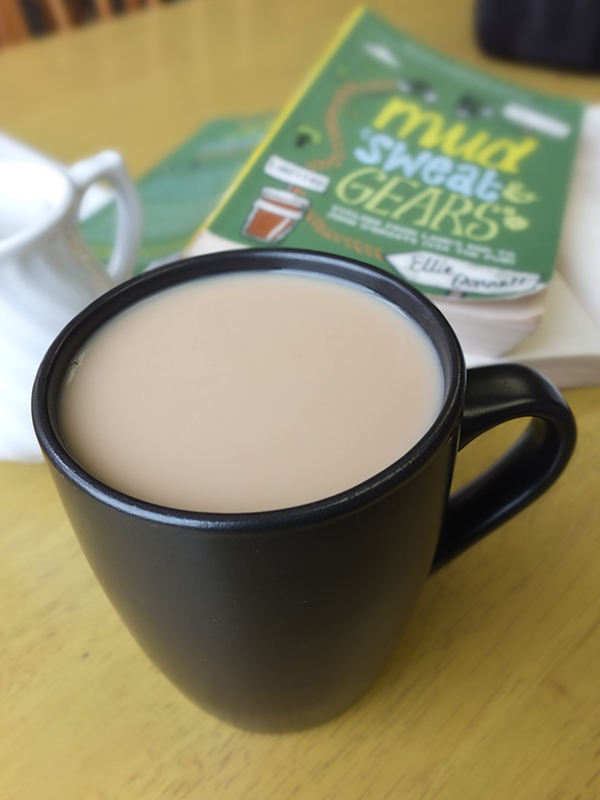 filled with beans and cheese, some filling carbs for a day’s cycling and I finished the book I’d been reading – Mud, Sweat & Gears by Ellie Bennet. 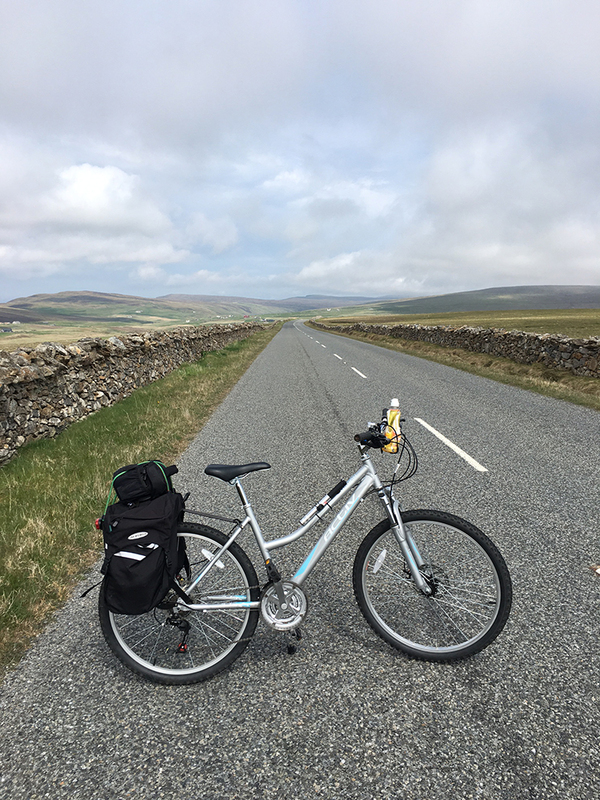 This book is about the adventures of nearly 50 year old Ellie who decides to embark on an end-to-end cycle of Britain with her friend Mick from Land’s End to John o’Groats, via the pub. It was an interesting read about long distance cycling through the eyes (words?) of another beginner, but I admit I had no idea where she was talking about until she got to Scotland and I actually recognised some of the places, places I’ll be passing through myself on bike very soon. They didn’t like Scotland much, it seems. Probably because they chose to cycle through it in May when it’s still cold and peeing it down all the time. Maybe it’s because they stopped at Orkney and didn’t come to the best bit of the UK – Shetland. Perhaps I’m biased though. 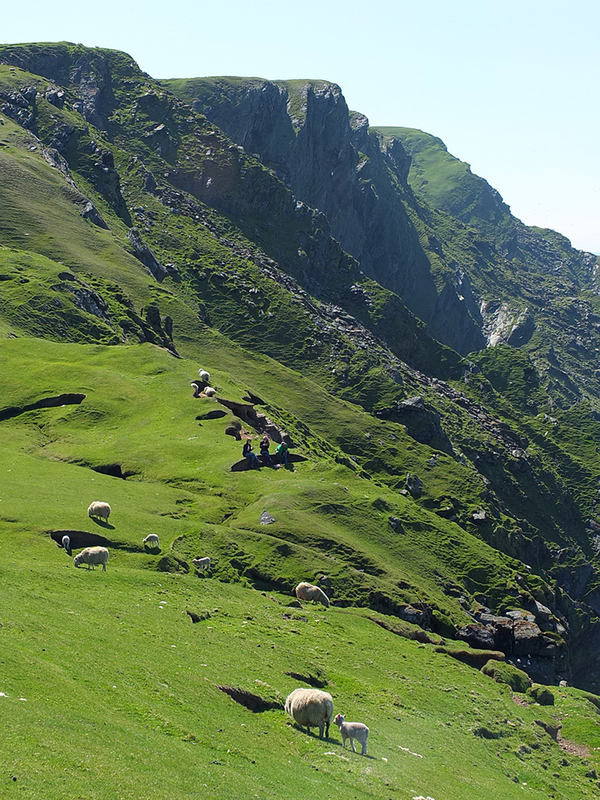 By the time I’d finished my lunch the sky was a vast blue dome above me, with barely a cloud to be seen. I cycled to the end of the road, literally. The road in the UK runs to this most northerly point at the car park of the nature reserve in Hermaness. 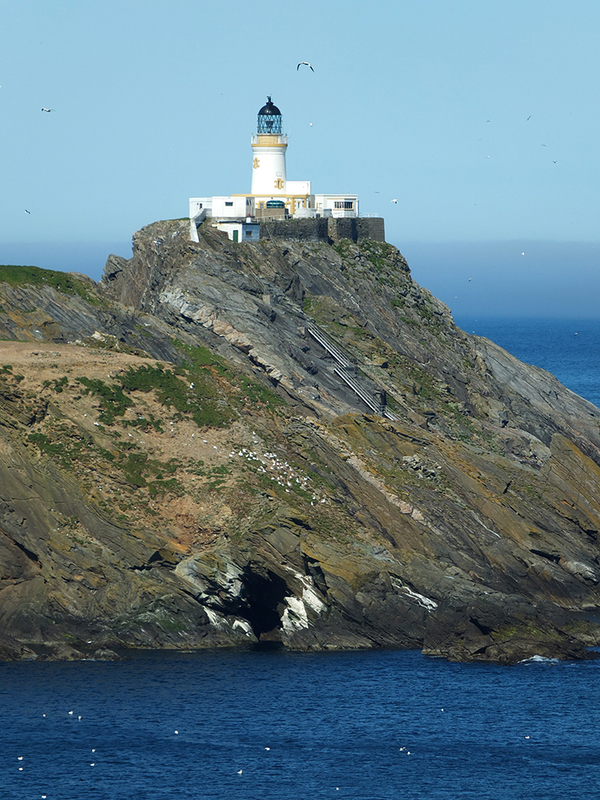 The building you see below is the warden’s home and the visitor centre which used to be the living quarters of the Muckle Flugga lighthouse keeper. I’ve lived in Shetland for over 17 years, and this was my fourth visit to Hermaness. The other three times the fog was so thick that you could barely see a thing. This was the first time it was sunny, and so I thought I’d take a wander out to the end to see the lighthouse in the sun. The previous times I’ve visited this area I’ve taken the direct path over the top of the hill, but this path was closed this year due to erosion, so walkers were recommended to take the alternate path along the coastline. 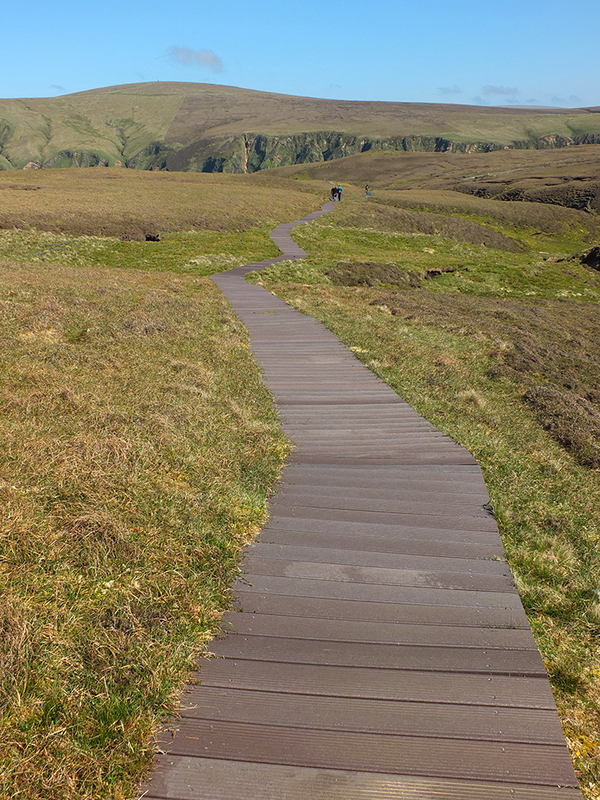 I had no idea there was a boardwalk all the way to the coastline – it makes for much easier walking than trying to scramble over eroding peat! 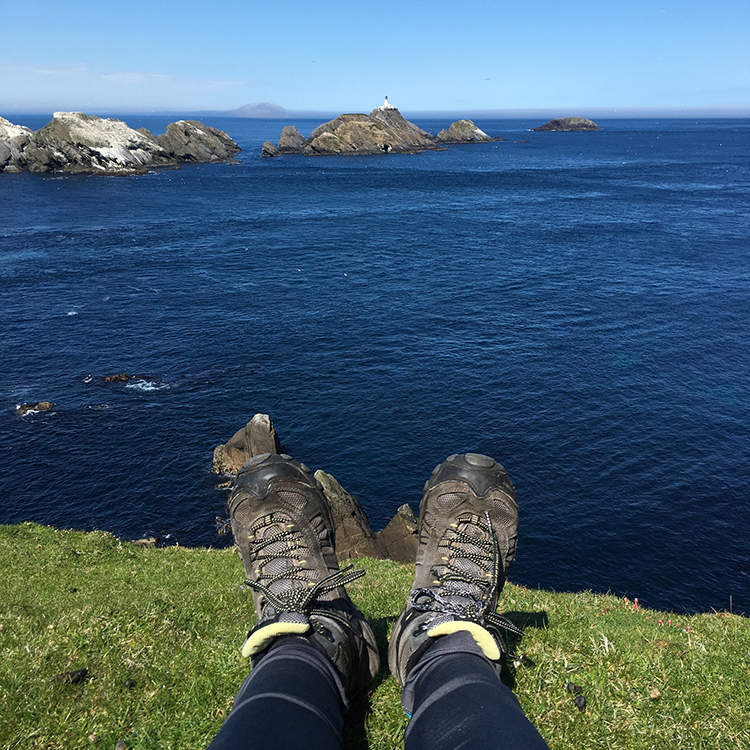 The boardwalk stops just a few metres from the cliff edges, and right away you are struck by the beauty of the dramatic coastline and the sound of thousands of nesting seabirds – puffins, fulmars, gannets and bonxies (Great skuas). There was barely a breath of wind and the sun was beating down. I was regretting not applying sunscreen during the morning’s sea mist! I carried on along the coastline until I reached the most northern tip of land. I’d never had the opportunity to explore this far before as the other times I’d been here I was with small children who I had to herd well away from the cliff edges, or my disgruntled and slightly hung over best friend who fell thigh deep into a bog in a howling gale and has abjectly refused to go hiking with me ever since. It was just myself. I could do what I wanted. So I carried on as far as I could, sat down on the edge of the cliff, and poked my knackered old hiking boots over the edge. Ok, I admit the photo doesn’t much look like I poked my feet out over the edge, but I assure you it felt like they were! I looked around me and could see no signs of any other humans other than a tiny red fishing boat out past the lighthouse. A few curious puffins watched me. No one knew I was here. I hadn’t intended on hiking out here; I had planned on exploring some old Viking ruins I hadn’t yet had the chance to explore, but because the weather was so perfect I couldn’t resist the opportunity and I spontaneously changed my plans. If I disappeared here no one would ever know! There was something a little bit scary knowing that. 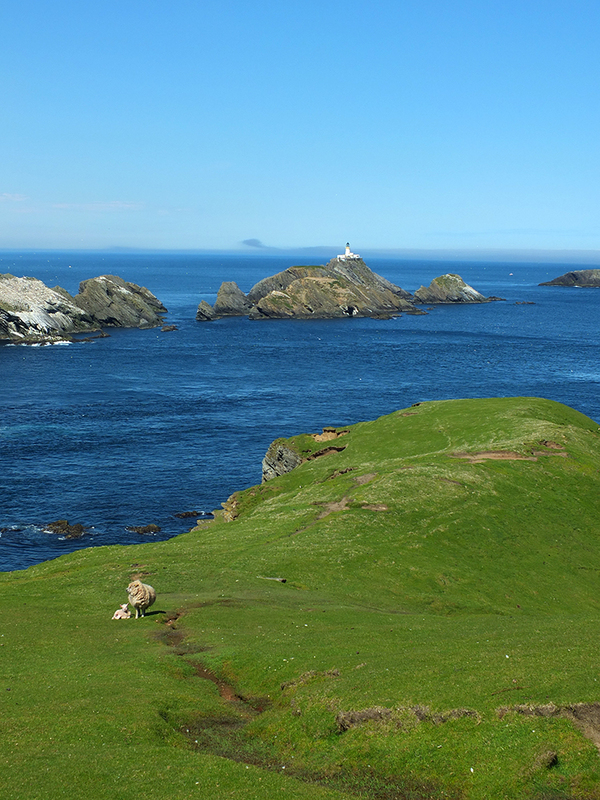 In the distance you can see the lighthouse on Muckle Flugga, designed and built by Robert Louis Stevenson’s father and uncle. R.L. Stevenson visited Unst as a young man and its dramatic landscape was the inspiration behind the map of Treasure Island. After meandering back to the car park in the glorious sun, pausing occasionally to watch the bonxies sitting on the tops of the hills, I worked my way back south to Windhouse Lodge. 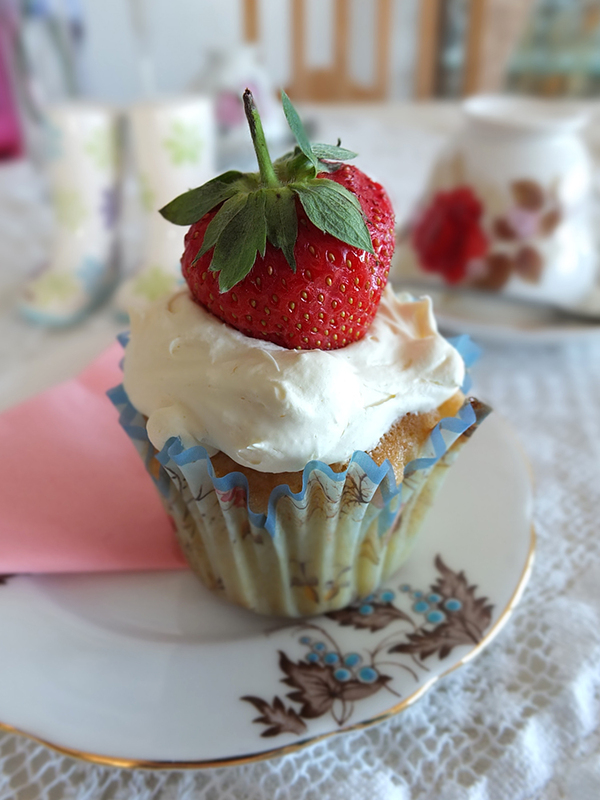 I stopped at Norwick Beach, the most northerly UK beach, and Victoria’s Vintage Tea Rooms, the most northerly tearoom in Britain, for some cake and a vintage lemonade. Tthey only serve cake and drinks on a Sunday, but the rest of the week they have a super selection of soups and sandwiches too. The German cycling couple I mentioned in Part 1 – Highway to Yell were also there, so I shared a table with them and we chatted about what we’d got up to that day. The way back to the Windhouse Lodge was remarkably uneventful except for the slight detour taking the inter-island ferry from Unst to Yell. The ferry I got on went from Unst to Fetlar and back to Unst before heading back to Yell, and I was invited up to the bridge to have a chat with the ferry captain and crew. This ferry runs via Fetlar every Sunday evening to pick up the school children on the island who have to head to the high school in the main town, Lerwick, for the school week. I can’t imagine how hard it must be for these children to be away from their families all week. The crossing was fantastic and the captain pointed out a very well preserved Pictish broch I hadn’t known about on Yell (watch this space – I am going to explore that area sometime soon!) and we even got to see a couple of neesiks (porpoises) swim by. It was getting late, the sun was setting and my energy levels were falling. A hire car stopped suddenly in front of me and two women got out – the couple from England I mentioned in Part 1 who were also staying at Windhouse Lodge. One offered to cycle my bike ‘home’ for me as I had had such a long day, and when I declined (that would be cheating!) they offered to relieve me of my loaded panniers, at least, to lighten the load. I thought that was so incredibly kind of them! The sun had just dipped below the horizon when I made it back to the lodge, and imagine my delight when I saw that tendril of smoke coming from the chimney. They’d lit the fire again! Big smile! I hadn’t remembered to pick anything up for dinner at The Final Checkout and so I’d planned on scoffing a dreadful cold tin of three bean salad, some potato crisps and an energy snack bar from my stash for my evening meal. Imagine my delight, again, when these complete strangers shared their dinner with me – peppered beef burgers, bulghar wheat and steamed greens cooked over a beach wood fire in a cast iron stove. A piping hot meal shared next to a crackling fire in great company recounting the days adventures to each other. The perfect end to a long adventurous day. It was with a tinge of sadness that I packed up the following morning and we all said our goodbyes. It reminded me of the fleeting friendships formed during summer camp when I was a child – you became such fierce friends over the course of a week and then they were gone, never to be seen again, and there was always that little moment of heartbreak as you got back to normal life. I think that’s a big part of traveling – meeting people and sharing stories. Little chance encounters with others can change the way we look at the world around us, and this trip has certainly sparked my wanderlust. Oh, and I left my copy of Mud, Sweat & Gears on the top of the book pile in the Lodge, just in case it takes the fancy of the next cyclist who stays there. 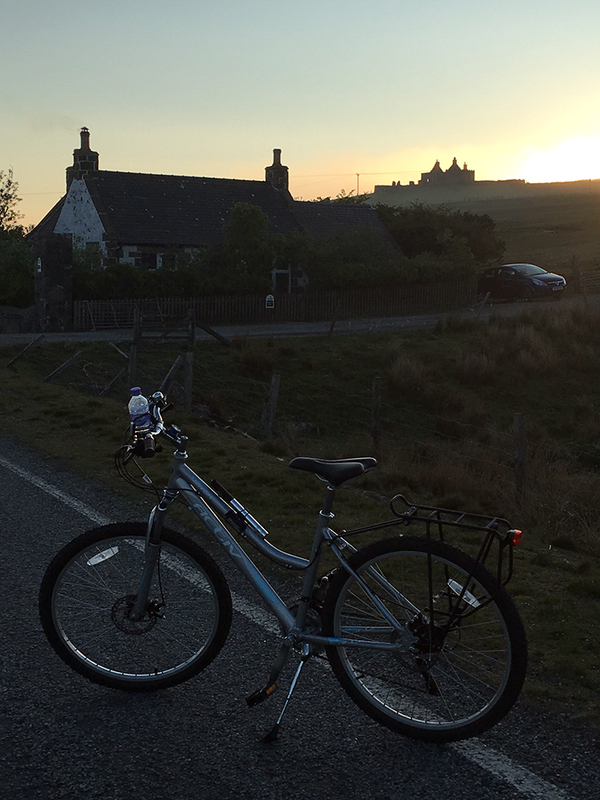 The following morning I set off from the lodge south through Mid Yell to Burravoe, stopping off at The Old Haa Museum & Visitor Centre (Yell’s oldest building built in 1672) for refreshments (the most delicious and affordable home bakes and coffee ever – £1 for a coffee, £1.20 for a cake!). I had a browse through their Yell whaling exhibition upstairs (fascinating!) before continuing south on the ferry to the mainland of Shetland. Let me make a suggestion: if you ever do make it up to Yell, turn right after you get off the ferry and take the scenic road up to Mid Yell. This stretch of road was an absolute pleasure to cycle on and the views are stunning. You’ll not regret it. 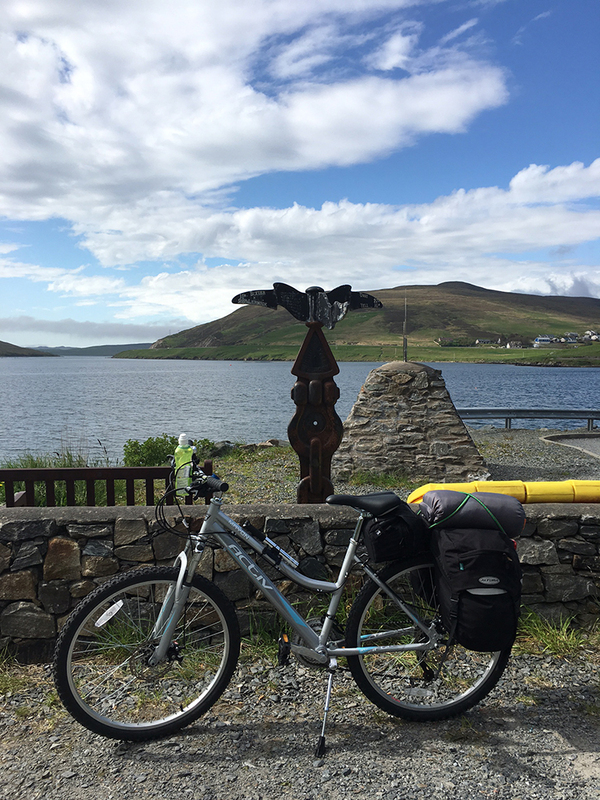 I cycled as far south as Voe when I made an executive decision: I wasn’t in the mood to cycle over the Alps (a particularly hilly 8 mile stretch of road between here and my home) with loaded panniers, not after a busy three days of cycle touring. The wind was picking up a bit too. 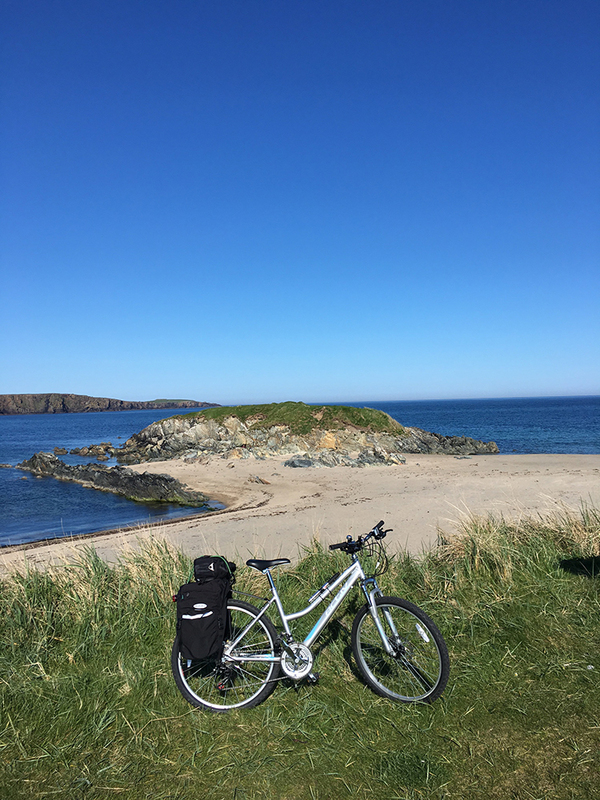 I went to the pub instead and bought a beer (a Corona with a slice of lime) to celebrate that I’d just completed the Shetland leg of the North Sea Cycle Route. 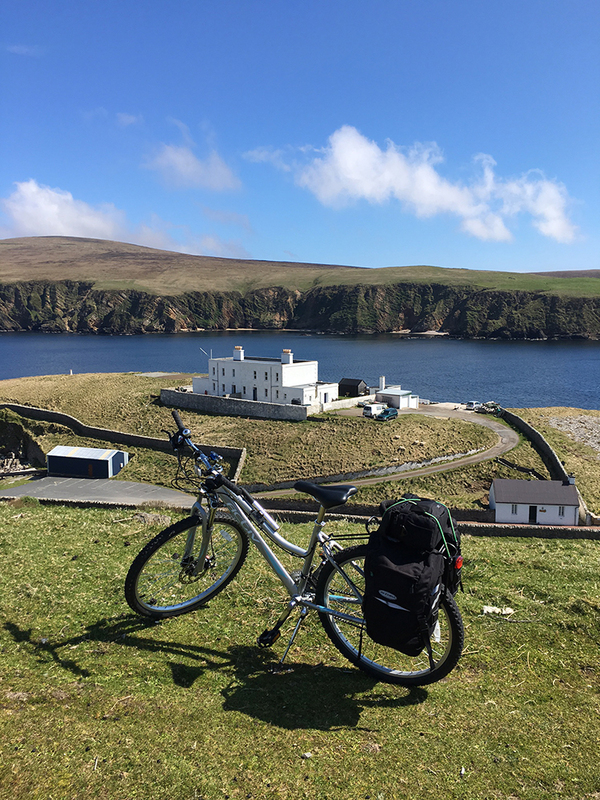 The weekend prior I’d cycled from my home to the most southern tip of Shetland, Sumburgh, a 100 mile round trip, and cycling from Hermaness to Voe meant I’d completed the stretch of Shetland road from top to bottom. My husband, bless his cotton socks, came with the car to fetch me and my bike. After discovering the Millenium Milestone hidden in the garden at the Windhouse Lodge I realised that there was another located at the pier in Voe (pictured above), one I had passed by dozens of times on my bike. Just another 998 to find! i would just love to be cycling that leg with you, it looks beautiful and so very like the rugged North Cornwall coastline I’ve just run today. I also didn’t apply sun cream as it was drizzling at the start and then came out roasting as I ran. 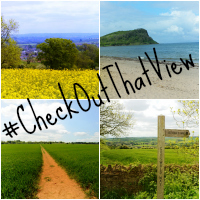 Well you are most certainly taking in the views in style, your photos are just stunning! I’ve been seeing a lot of Britain pictures but never been there before. Looks lovely every single time. I can’t wait to visit and who knows … someday check out those places too especially the haunted house. What an incredible adventure! Your photos are absolutely stunning! I’m impressed by nearly 50 miles in one day too! 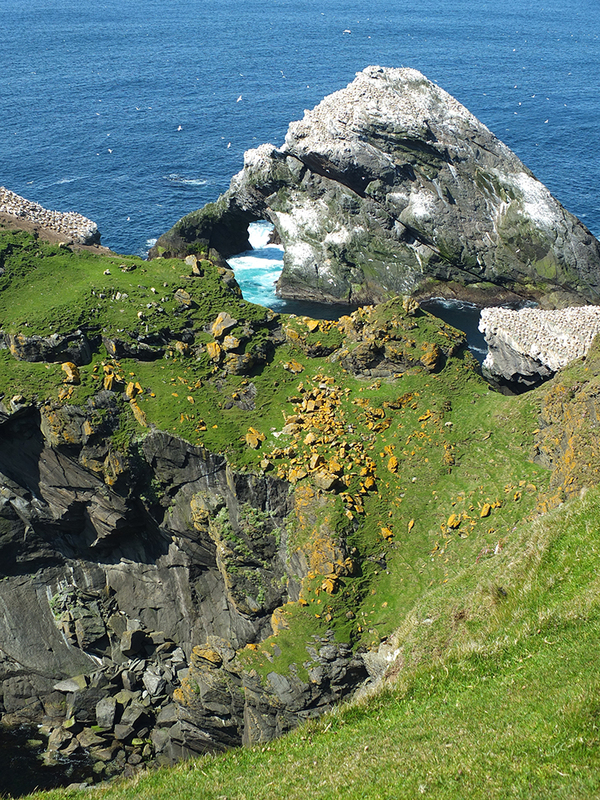 I’d love to visit the Shetlands, I’ve never been and it looks idyllic! Would make a lovely holiday and getaway. indreamworld recently posted…BBQ Season is upon us…sausages, charred food and… flies?! what a great exploration. I do love that you don’t pressure yourself in discovering the place. You got lovely shots here . Wish to see it as well and try a cup of coffee at The Final Checkout Cafe. This is part of the world that I have always wanted to visit and your photos are making me want to go even more! 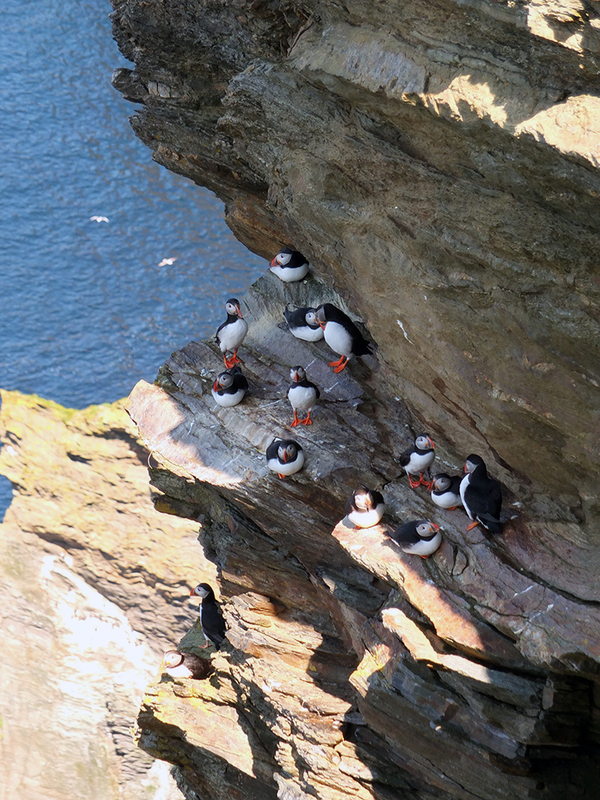 I am loving the scenery especially the photos of the puffins. OMG your braver than me staying in a haunted house. Wow! What an awesome post. I really hope that one day I am brave enough to travel by bike for a few days at a time. Beautiful pictures. What a fantastic place to visit. This is exactly why I need to get a bike. To be able to ride off and explore! It’s really cool that peat is still used to such an extent. That coast is amazing. I can’t believe how peaceful it looks. I would feel exhilarated too with my legs over the cliff and the puffin was very photogenic wasn’t he/she? I love that you were all alone too what an adventure! What an amazing journey! Your photos are spectacular, it’s always great to be reminded how spectacular the British coastline is. Thank you! 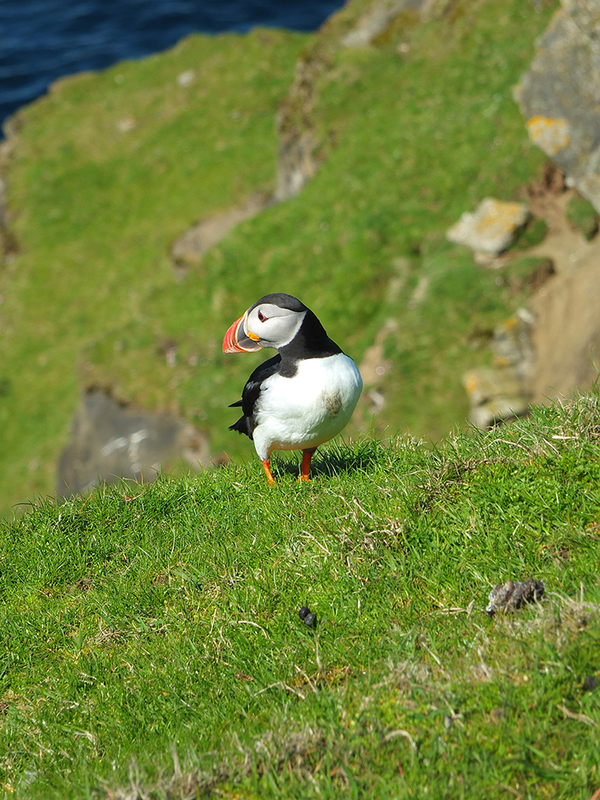 What an amazing adventure and I love your photos, the puffins look gorgeous. You’re very lucky and brave too! You are bold staying in a haunted house. I would be too scared. Lol.